The muscles of mastication are concerned with movements of mandible in the temporomandibular joints during mastication. All are found in or around the infratemporal fossa. All are added into the ramus of the mandible. All are innervated by the mandibular division of the trigeminal nerve. All are concerned with movements of the mandible on the temporomandibular joints. All grow from mesoderm of the very first pharyngeal arch. 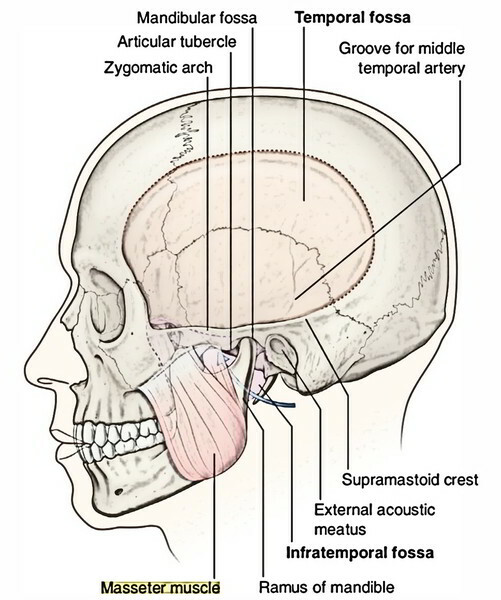 It’s connected above to the temporal line and below to the zygomatic arch and is covered by tough temporal fascia. It’s located in the temporal fossa and is a fan-shaped muscle. Whole of the floor of temporal fossa with the exception of the part created by the zygomatic bone. Deep surface of the temporal fascia. The temporalis muscle is fan shaped. The anterior fibres are oriented vertically, the posteriormost fibres are disposed nearly horizontally and interceding intermediate fibres are positioned obliquely. The temporalis is supplied by the anterior and posterior deep temporal nerves, the branches of the anterior section of the mandibular nerve. The temporalis muscle elevates the mandible and so shuts the mouth and approximates the teeth. This movement needs both the upward pull of the anterior fibres and backward pull of the posterior fibres. Posterior fibres retract the mandible after it’s been protruded. The masseter (Greek: masseter = a chewer) is a thick quadrilateral muscle covering the lateral surface of the ramus of the mandible consisting of its coronoid process. The condylar process is left uncovered. Superficial layer is largest of the 3 layers of masseter and originates by a thick aponeurosis from: maxillary process of zygomatic bone and anterior two-third of the inferior border of the zygomatic arch. Middle layer originates from lower border of the posterior one-third of the zygomatic arch. Deep layer originates from deep surface of the zygomatic arch. Superficial fibres pass downwards and backwards at 45° to be added into the angle and lower posterior half of the lateral surface of the ramus of the mandible. Middle fibres pass vertically downwards to add into the central part of the ramus. Deep fibres pass vertically downwards to fit into the upper part of the mandibular ramus and its coronoid process. Intramuscular tendinous septa in the superficial layer are liable for creating ridges on the ramus of the mandible. Middle and deep fibres collectively represent the deep part of the masseter. The masseter is supplied by a masseteric nerve, a branch from anterior section of the mandibular nerve. The masseter muscle elevates the mandible to shut the mouth. It’s a short, thick conical muscle with its apex pointing backwards. It enters backwards and somewhat laterally from the roofing and medial wall of the fossa to the neck of the mandible. The upper smaller head appears from the temple surface and crest of the higher wing of the sphenoid bone. The lower bigger head originates from the lateral surface of the lateral pterygoid plate of the sphenoid bone. Pterygoid fovea on the very front of the neck of the mandible. Articular disc and capsule of the temporomandibular joint. Lateral pterygoid is supplied by a branch of anterior section of the mandibular nerve. Lateral pterygoids of 2 sides depress the mandible (opens the mouth) by pulling forwards the condylar processes of the mandible and the articular discs of the temporomandibular joints. Medial and lateral Pterygoid muscles of 2 sides acting jointly protrude the mandible. Medial and lateral pterygoid muscles of the 2 sides contract alternately to generate side to side movements of the lower jaw as in mastication. The lower head of lateral pterygoid enters between the 2 heads of the medial pterygoid muscle. It’s the only masticatory muscle, which opens the mouth. The articular disc of temporomandibular joint is developmentally a part of tendon of lateral pterygoid muscle. Buccal nerve, a branch of mandibular nerve. It comes out via the gap to supply sensory innervation to the skin and mucus membrane of the cheek. The medial pterygoid is a thick quadrilateral muscle and is composed of 2 heads: superficial and deep. The small superficial head (a small slide of muscle) originates from maxillary tuberosity and lateral surface of the pyramidal process of palatine bone. The large deep head (creating the majority of muscle) appears from medial surface of the lateral pterygoid plate and grooved surface of the pyramidal process of palatine bone. The fibres run downwards, backwards and laterally to be added by a powerful tendinous lamina into a roughened area on the posteroinferior part of the medial surface and angle of ramus of mandible as high as the mandibular foramen and as forwards as the mylohyoid groove. The medial pterygoid is supplied by a nerve to medial pterygoid, a branch from the primary trunk of the mandibular nerve. Medial pterygoids of 2 sides elevate the mandible to assist in closure of mouth. Acting with lateral pterygoids, the medial pterygoids protrude the mandible. When medial and lateral pterygoids of 1 side act collectively, the corresponding side of the mandible is rotated forwards and to the opposite side. Medial and lateral pterygoids of 2 sides when contract alternately generate side to side movements that are utilized to grind the food. Lateral pterygoid (Short, thick conical) Upper head from infratemporal surface and crest of greater wing of sphenoid. The main muscles of mastication in many cases are referred to as muscles of mastication. The muscles of mastication and their motor innervation can be analyzed medically by requesting the patient to clench his teeth repeatedly and after that palpating the temporalis and masseter in the temporal fossa and over the ramus of mandible, respectively. The muscles of mastication are concerned with the movement with which part of the head? Which of the following statements is FALSE regarding muscles of mastication? The Temporalis originates from whole of the floor of temporal fossa with the exception of the part created by which bone? 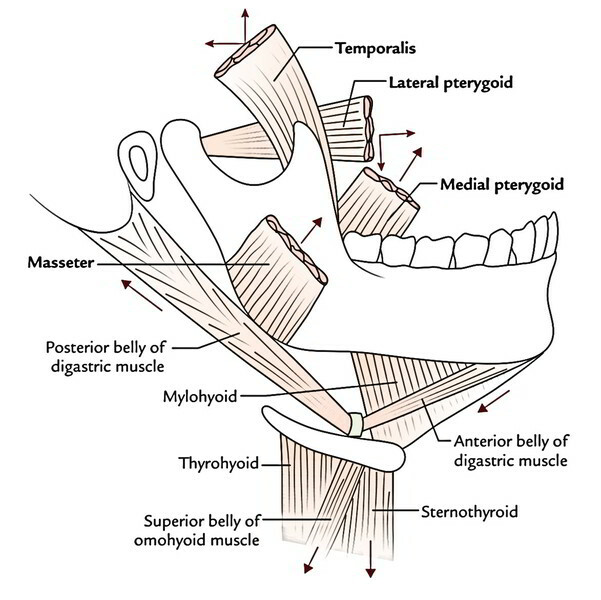 Which pharyngeal arch do the muscles of mastication develop from? Where does the temporalis muscle insert? Which muscle is the medial pterygoid found inferior to? What is the main action of the lateral pterygoid muscle?